The cake looks delicious! I don't think I had even heard of frappacino when I was 10. lol Pierce sounds like a great kid and I love his eclectic interests. Have a good break! What a great birthday, and he has good taste for cake. I like a mummy bag when it is snowy out.I have a sweater I put over the opening to keep the warm in, and a few times to keep the snow out sleeping under the stars. Happy Birthday Pierce! That cake looks delicious. Cute picture of him in his mummy sleeping bag. What a difference a year makes! He asked for a very sophisticated and adult cake! Phil loves salted caramel too. Anne is 10 as well, and that is where we really saw a big change. I don't remember Pierce wearing glasses. Seems more and more kids need them lately. Maybe over half of the classrooms? Perhaps nowadays we are detecting eye problems much better than we used to. I hope you are O.K!! Maybe you are just very busy right now and need a break. Happy Birthday, Pierce! I'm sure your mama's cake tasted delicious! Happy camping in your new mummy bag, too! Happy Birthday to Pierce!!! Time flies! I remember my son hitting double digits and this year he turned 20, no more being mom to my teen son...now he's a young man. :) Enjoy everyday with your boys! Happy Birthday to Pierce. Time goes too fast! So that's why I haven't heard from you this week. 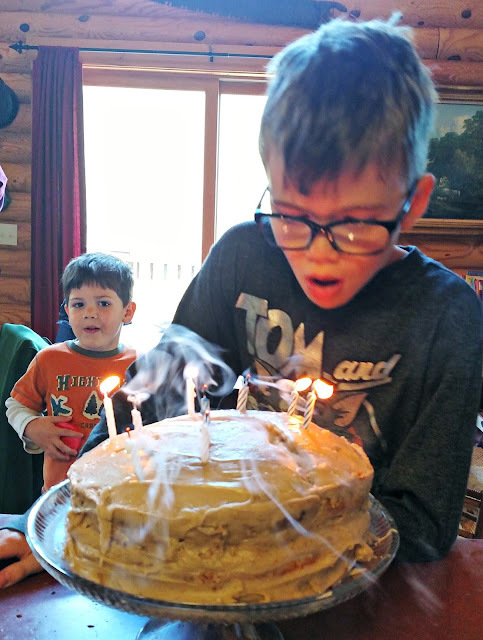 =) What a cute boy--and I bet the cake was fabulous. There's nothing better than these little ones in our lives, eh--and the chance to truly marvel over their wonderfulness. Happy Birthday, Pierce! Happy New Sleeping Bag!! I fully understand the joys of a good sleeping bag. Always something - filled with Life - going on in your world. Thank you for taking time to share . .
happy time away from blogging. Woo hoo! Happy birthday to Pierce! Looks like he loves that sleeping bag! 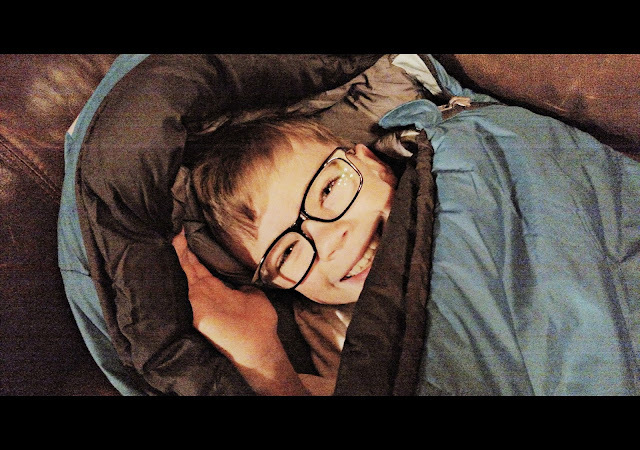 I am so happy he got his mummy sleeping bag! I'm glad he had a happy birthday. It's so nice when the kids are that age and the family can be together for birthdays. I admire your cake, it looked delectable. Happy Birthday Pierce! And that cake looks divine!! We got a heavy frost here in southwestern Ohio where we live at Brookville. I would want a heavy sleeping bag if I had to be outside now. We still have our original Polaroid Land Camera. The inlaid leather pieces have degenerated to almost like dust but you can still see the leather. I assume it still works but the reason we gave it up was the cost of the film. Happy belated birthday to Pierce! Looks like he had a great one. Happy Birthday to him!! It does look like he loves this sleeping bag. Hear hear for camping! Happy Birthday Pierce! Ten is such an amazing age. To mummy sleeping bags and salted caramel. You are one fun kid!